Coach Keith Haske is my friend and basketball coaching mentor. 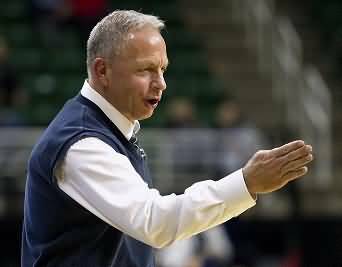 Keith is currently the head boys and girls varsity coach at Traverse City St. Francis High School (TCSF - in Michigan) and is doing very well there, with his girls' team the Michigan State Runner-Ups this year (2016). You can see from his record below that he has been a very successful high school coach with a number of Conference, District and Regional titles, and a number of State Championship appearances. He was our school principal and head boys coach (and for awhile, girls coach too) in Charlevoix, MI for a number of years before moving to TCSF. Years ago, he took me on as an assistant coach and so I worked with Keith and learned from him for a number of years. Our program was down when he first came to town, but soon we were winning and participated in a number of trips to Michigan State's Breslin Center in state semi-final and final appearances. When I first started with Coach Haske, I asked him, "Coach, what do you want me to do?" He answered, "Just learn and teach." Great advice for any assistant coach or aspiring young coach. Just learn the system, and then help teach it. And Keith's system was lots of fun to learn... uptempo, fast on both defense and offense... full-court pressing, fast-breaking, etc. Lots of kids get to play and they love it... boys and girls. Practices are fun and competitive. 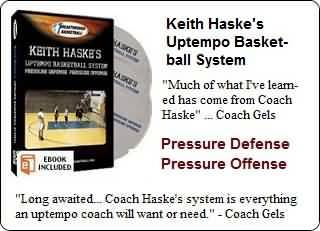 Now he has finally recorded the whole system, defense and offense, in a 2-DVD set titled "Keith Haske: Uptempo Basketball - Pressure Defense/Pressure Offense". Click the image for more details and a table of contents. It's great! For me, it was like a trip back in time when I was learning it, and the DVDs pull it all together. If you are an uptempo coach, Coach Haske's system is all you will need. Years ago, Keith learned a lot of it from Rick Pitino, with influence also from Paul Westhead and Bob Knight. There are a number of articles already on Coach's Clipboard website that present some of Coach Haske's concepts... e.g. the full court match-up press system, the 80-60-40 press offenses, a number of quick hitting plays, our 3-2 out and 4-out offenses, half-court defense, and a number of drills that we have used. Coach Keith Haske's Charlevoix Radyers in MSU's Breslin Center state tournament.